Boxers and bodybuilders embody many of the traits of elite athleticism including endurance, strength and coordination. However, the two sports also differ in many ways. Boxers and bodybuilders train for different performance goals, which means specialized workouts and specific measurements of progress. Of course, boxers benefit from weightlifting and bodybuilders benefit from agility drills, so the two activities are not completely isolated. According to gym owner and personal trainer Tom Venuto, bodybuilding is a cosmetic sport by definition. Bodybuilders are judged for their aesthetic presentation, not for skill. For bodybuilders, weight training and athletic conditioning serve as a means of obtaining a specific body composition, not as a means of improving performance. Boxers on the other hand train for a fight. Their training focuses on improving skills and performance so they can beat their opponents in functional, not cosmetic, competition. Boxers run, spar and complete other drills in order to perform better. Boxing does improve physical aspects but is not the goal of the sport. Bodybuilders aim to increase muscle mass. They lift heavy loads at small repetitions in order to sculpt large, symmetrical muscles. Personal trainer Ross Enamait states that bodybuilders do not have to be concerned with functionality, as the focus is on aesthetic presentation, not performance. Boxers, on the other hand, build muscle definition through high repetitions and low loads. While bodybuilders improve their maximal strength, boxers focus on explosive strength and reactive strength. Muscle bulk inhibits a boxer's flexibility, agility and speed, but lean muscle supports both offensive and defensive tactics. Boxers perform a lot of cardiovascular conditioning. A competitive boxing match involves up to 12 two- or three-minute rounds of constant movement that tax both the lungs and the muscles. 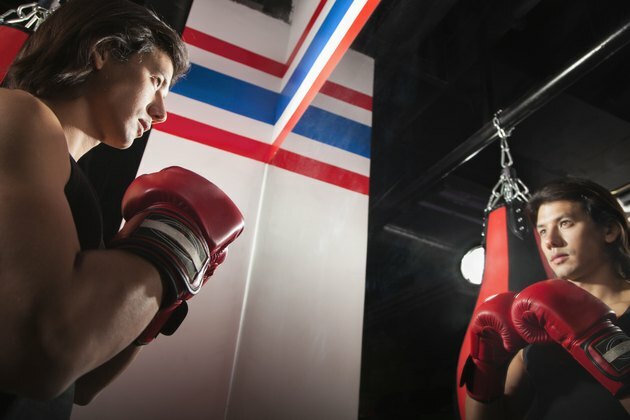 Jamie Hale, fitness and nutrition consultant, suggests that most boxing drills prepare individuals to survive a competitive match. Pad work, heavy bags, sparring, jumping rope and circuit training all mimic the various movements and techniques necessary in the ring, while testing overall fitness and muscular endurance. For bodybuilders, cardiovascular conditioning reduces body fat percentage, making muscle more visible. It does not improve competitive performance and consequently is not the focus of training. In fact, most bodybuilders limit running or similar exercise to reduce the risk of losing muscle. Weight management as a whole differs greatly between boxing and bodybuilding. While both sports include weight classes for competition, the reason for these divisions differ. Bodybuilders compete against athletes of a similar size to create a standard of comparison. Boxers fight in weight classes to ensure a fair fight and prevent serious injury. They usually focus on cutting weight and entering a lower division, while bodybuilders aim to gain as much muscle as their body composition and genetics will permit. Proper nutrition is important in both cases. However, bodybuilders consume additional calories to support muscle growth, while boxers limit their diet to promote weight maintenance and even weight loss prior to a fight.